charmcityartsmaven: Trumpeter B. Woody Sets Summer Concert Schedule at An die Musik Live! Trumpeter B. Woody Sets Summer Concert Schedule at An die Musik Live! Saturday, July 22, 8 and 9:30 p.m.
Friday, August 11, 8 and 9:30 p.m.
Brandon attends the Brubeck Institute, which is a full scholarship Jazz program in California that accepts only five people every 1-3 years. Next year he will attend the Manhattan School of Music on a full ride. Brandon has won numerous competitions such as Berklee Jazz Workshop 2014, Young Arts in 2015 and 2016, BSA Concerto competition in 2016, Peabody concerto competition in 2016, Shenendoah Jazz Soloists Competition in 2016. Has studied privateley with Ambrose Akinmusire, Sean Jones, Tiger Okoshi, Andrew balio, Dontae Winslow. 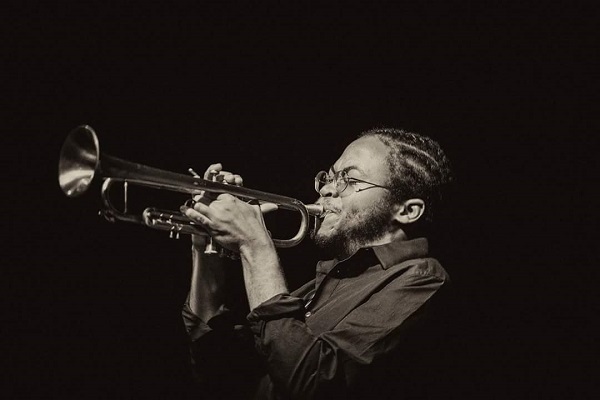 Brandon has played with Benny Maupin, Lewis Nash, Stefan Harris, Danilo Perez, Terri Lyne Carrington, Steve Wilson, Essiet Essiet, John Pattituci, Ed Simon, Warren Wolf, Carmen Bradford. Brandon has performed at venues such as Jazz at Lincoln Center Appel Room, Lincoln Center Atrium, The Meyerhoff, The Lyric Opera House, The Kimmel Center, Marthas Vineyard Jazz Festival, Monterey Jazz Festival, Watts Tower Jazz Fest LA, Davis Jazz Festival, An die Musik, Twins Jazz Club, Wally's, Dizzys Jazz Club Coca Cola. Brandon recently opened up for the Newport Jazz Festival, and performed in the Danilo Perez Band. Brandon leads his own group under the name of Upendo, which means love in Swahili.